Petrol price touched Rs 85.15 per litre in Tamil Nadu, one of the highest prices in the country. 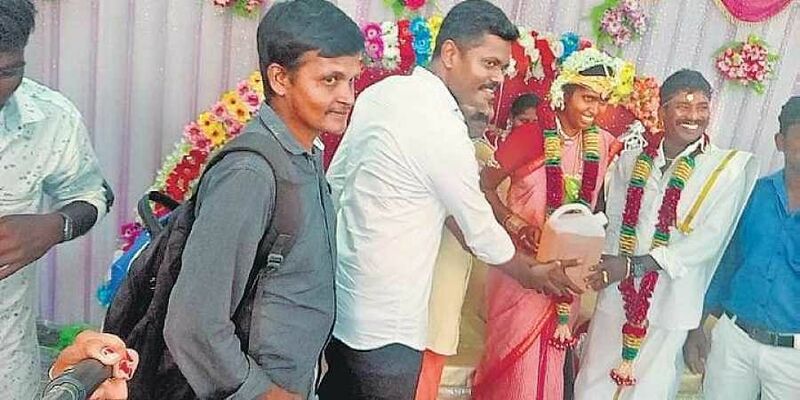 CUDDALORE: For the “smooth running of their married life”, a couple who entered into the wedlock near Chidambaram was presented with 5 litres of petrol by one of their friends on Sunday. The couple, Elanchezhian and Kanimozhi, got married in Kumaratchi village of the district on Sunday morning. The event witnessed the presence of members of Democratic Youth Federation of India (DYFI) and students of the Government Nandanam Arts College in Chennai. One of the students and a member of DYFI, Prabhu, gifted a can filled with 5 litres of petrol to the couple. He told Express that the present was an attempt to create awareness among public about the record hike in fuel prices in the country. “Fuel prices are rising steeply across the country. So, some of Elanchezhian’s friends including me decided to present the couple with petrol and alert the people about the valuable product,” he said. Upon receiving the gift, the couple, along with people present at the wedding hall, was surprised. Later, the friends filled the new bike that had been presented to the groom with the fuel. “Since the fuel prices were surging for the last few weeks, we wanted to bring it to the fore how a common man had been getting affected due to the hike. The couple felt happy after receiving our gift”, said Deepa, another DYFI member and friend of Elanchezhian.